Breaking Bad News - Predictions for Season 5 Part 2 I met a traveller from an antique land who said: `two vast and trunkless legs of stone stand in the﻿ desert. near them, on the sand, half sunk, a shattered visage lies, whose frown, and wrinkled lip, and sneer of cold command, tell that its sculptor well those passions read which yet survive, stamped on these lifeless things, the hand that mocked them and the heart that fed. and on the pedestal these words appear. My﻿ name is Ozymandias, king of kings: look on my works, ye mighty, and despair!" nothing beside remains. round the decay of that colossal wreck, boundless and bare the lone and level sands stretch far away. Predictions for Season 5 Part 2. Well after watching Breaking Bad a ridiculous amount of times, I have started to put together pieces of the show which could possibly help predict events that could occur in season 5 part 2. Will Walt kill Jesse? My Predictions of what's going to happen in Season 5 Part 2 of Breaking Bad! Breaking Bad. A show which uses A LOT of hidden messages which are hard to spot out. Now you may be wondering why I think Walt will kill Jesse, I have my reasoning but first I want to talk about another possible death. A character we probably all hate (I do), Skyler. Now at the beginning of season 5, episode 1 we see a flash forward of Walt in a cafe with a fry-up in front of him. That fry-up contains bacon (obviously) BUT he has cut the bacon up to shape them into a '52' as it's his birthday on that day. Now you may be wondering, what's this got to do with Skyler being killed by Walt? Well to understand this we're gonna have to rewind a bit further back. In season 1, Walt kills Krazy 8. As we know, Walt always cut the crusts of his sandwiches as Krazy 8 didn't like the crusts, After Walt kills Krazy 8, we see Walt make his own sandwiches a lot and we always see him cutting of the crusts even though he never used to do this as he didn't mind eating the crusts. Now later on in the show after Walt kills Gus, we see him act like Gus, always taking control of every situation, his say is the only one that matters and making sure he's one step ahead. As well as this after Walt kills Mike, we see that he starts to drink Mike's special drink. Incase you haven't spotted the pattern yet, after Walt kills someone, he starts to act like them! (Cutting the crusts, acting like he's Gus and drinking the same drink as Mike). Now who always cuts Walt's bacon up into his age on his birthday? Skyler did... DUM DUM DUUM. 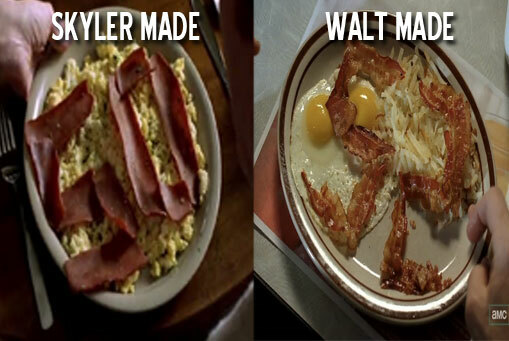 This is why I believe that Walt will kill Skyler due to the hidden message that whoever Walt kills, he acts like them. Now you may be wondering what about Jesse? When does he act like Jesse in a flash forward that we've seen? Well recently 17 new photos have been released for the new season. In these images we see that Jesse has a full beard now. 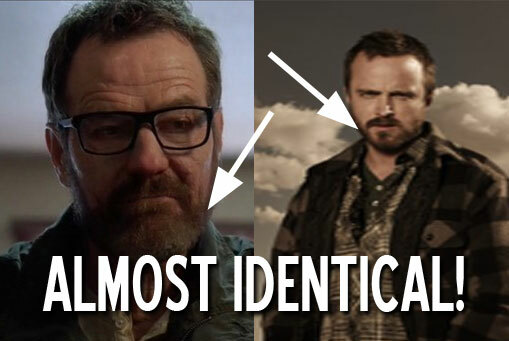 Now rewind again and in that flash forward at the beginning of season 5, we see that Walt's beard looks almost identical to the beard that Jesse's grown. That means Walt's started to behave like Jesse in terms of the beard being the same. (Walt always has his goatee beard). Also in season 5 episode 3 Mike says to Walt and I quote "Just because you shot Jesse James, don't make you Jesse James" JESSE! They could of picked any famous bad person like Al Capone or even Pablo Escobar but they choose someone called Jesse. With the hidden messages they use in Breaking Bad, they wouldn't just pick that name randomly. Anyway that's my view on why I think Walter White kill Jesse and Skyler. What do you think? Leave your comments and please feel free to leave your views on what you think may happen.